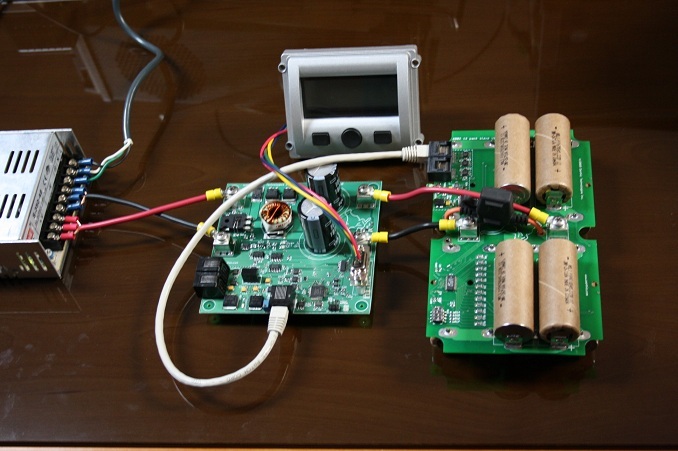 The next logical step after building a Lithium ion battery management system would be to build a compatible charging system, so, this is it! 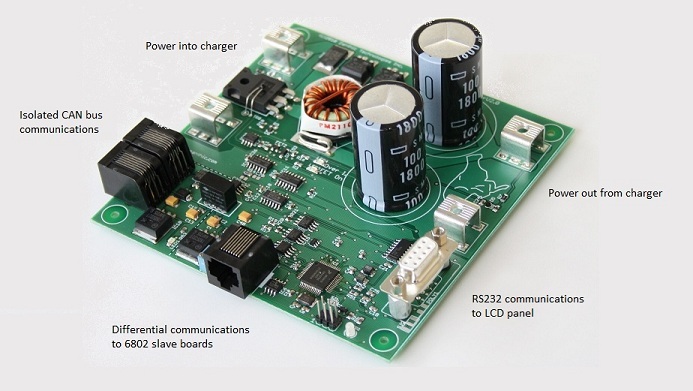 The above picture shows the main smart charger board. I ended up taking a fair bit of the BMS board and incorporating it into the charger electronics so that it could function in a number of different configurations. 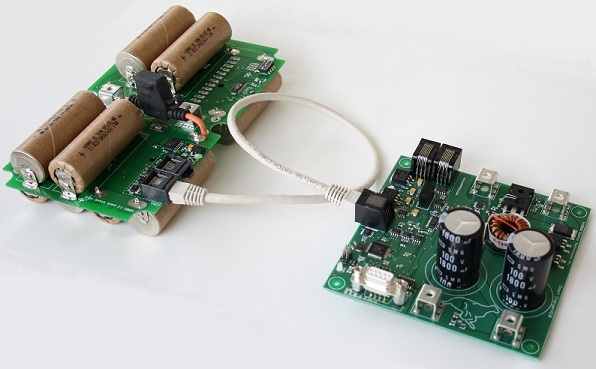 The smart charger uses the same method of differential communications so it can communicate directly with the Linear LTC6802 boards in a daisy chained fashion. One board is shown here but a maximum of 16 could be used. 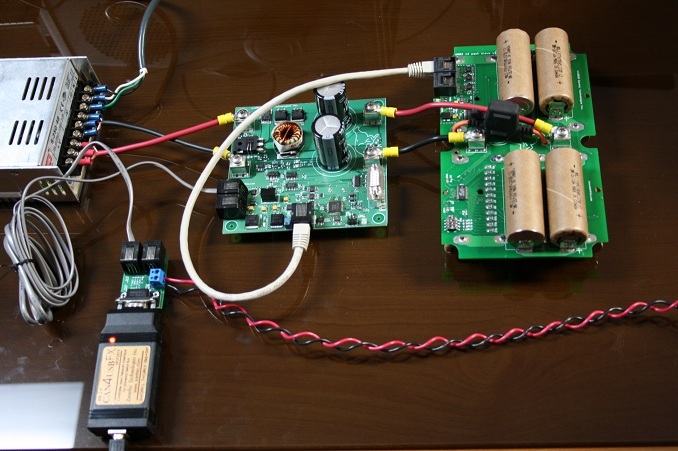 This is a complete, working setup with power coming from a DC power supply (left) and flowing through the smart charger. The CAN-4-USB/FX interface is connected to a PC that is running configuration and monitoring software. 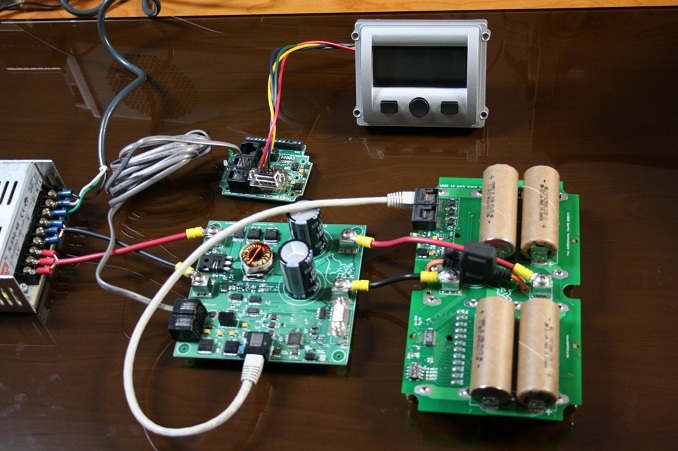 The DC input can be up to 75 volts but can be throttled back to charge a single cell if needed. The 12 cell pack shown will have a final charge voltage of 50.4 volts. There are a number of isolation points in this system. The CAN bus, and therefore the PC, are isolated and the 6802 communications are isolated as well. This means the CAN bus ground, the power supply ground and the 6802 communications bus ground are all isolated. Yet another configuration would be to have the smart charger work in a stand along mode and have charging information and simple configuration choices displayed on the LCD screen. Copyright © 2010 Zanthic Technologies Inc. All rights reserved.